ALEI hosts an Agricultural and Environmental Law Conference each November. This event attracts agricultural professionals, attorneys, educators, environmentalists, farmers, policymakers, and students to discuss the complex intersection of environmental regulation and agriculture in Maryland. ALEI prides itself on hosting an event that brings farming and conservation experts together in a forum that allows for an exchange of ideas and education for conference attendees on current legal topics of interest. Previous year’s conferences have featured topics such as agritourism, aquaculture leasing, anaerobic digesters, alternative energy on the farm, developing topics in agricultural and the environment, and nutrient management. 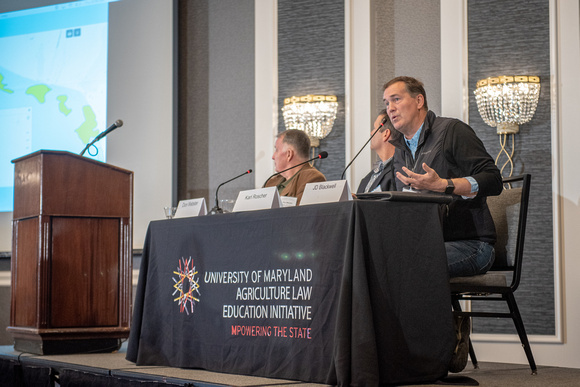 Aquaculture grower JD Blackwell discusses Maryland’s aquaculture industry, its impact on the bay, and how the state’s aquaculture leasing program impacts growers at the 2018 Agricultural and Environmental Law Conference. Rural Maryland Council MARBIDCO Harry R. Hughes Center for Agro-Ecology, Inc.
We extend our deepest gratitude to our sponsors!